EIA’s Short-Term Energy Outlook (STEO) revised its standard set of figures in its July 2018 publication. To provide more clarity on changing natural gas and hydrocarbon gas liquids (HGL) markets, two new natural gas figures and four new HGL figures are now included with the monthly forecast. Many of the figures previously included in STEO have been redesigned. Two new natural gas figures illustrate changes in the natural gas market forecast. 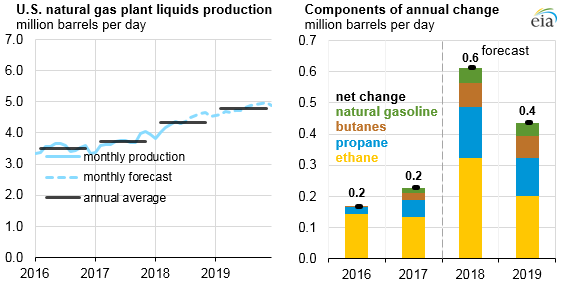 EIA forecasts that U.S. natural gas production, consumption, and exports will grow through 2019. U.S. dry natural gas production is forecast to increase by 11% in 2018 and average 81.3 billion cubic feet per day (Bcf/d) for the year, surpassing the previous record set in 2015. Natural gas production is expected to continue increasing in 2019, averaging 84.5 Bcf/d. Natural gas consumption is forecast in the STEO to increase by 7% in 2018, averaging 79.7 Bcf/d for the year, then decrease slightly in 2019. EIA expects higher annual natural gas consumption in 2018 mainly because relatively cold weather earlier this year led to strong residential and commercial heating demand, and because warmer forecast temperatures are projected to lead to greater use of natural gas in the electric power sector this summer. The United States became a net exporter of natural gas in 2017 on an annual basis for the first time in 60 years, averaging 0.3 Bcf/day. 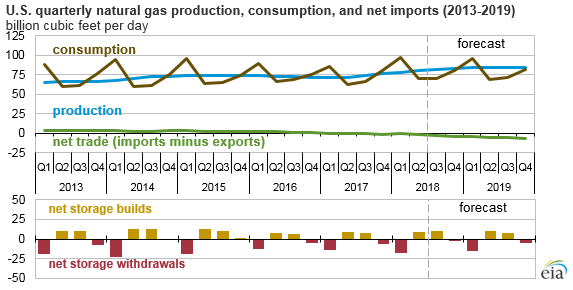 EIA expects exports of both pipeline and liquefied natural gas to continue to increase while imports—almost all of which are pipeline imports from Canada—remain steady. 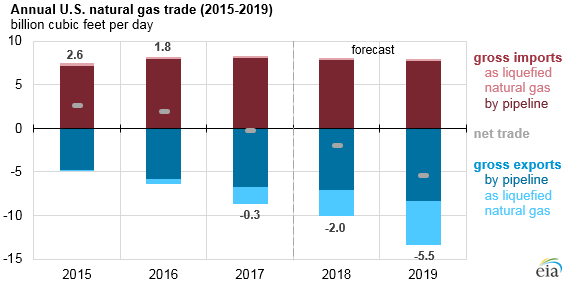 As a result, net natural gas exports are forecast to average 2.0 Bcf/day in 2018 and 5.5 Bcf/day in 2019. Four new figures illustrate trends in the HGL market and provide detail for individual HGL products. 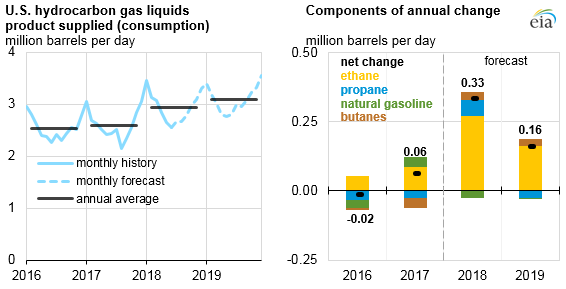 EIA expects that increased natural gas production will result in continued production growth of hydrocarbon gas liquids—butanes, ethane, propane, and natural gasoline—at natural gas processing plants. Natural gas plants are expected to produce an additional 600,000 barrels per day (b/d) of HGLs in 2018 and an additional 400,000 b/d in 2019, with ethane accounting for more than half of this growth. EIA expects increased U.S. petrochemical demand and exports to stimulate higher ethane production. Combined net exports of all HGLs increase by 500,000 b/d by 2019, and propane exports account for more than one-third of this growth. 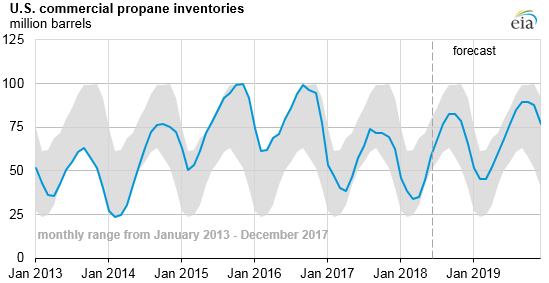 Propane inventories, which have been lower than average since early 2017, are expected to return to their previous five-year averages (2013–17) by September. Note: Inventories exclude refinery-grade propylene.